There are two basic aquarium plumbing designs: drilled and not drilled. Drilled tanks have one or more holes drilled in the bottom of the tank in order to allow water to be pumped into the tank from below and to allow water to flow from the tank into a sump or container below the tank Tanks which are not drilled rely on either hang-on, hang-in tank filters, or hang-on tank overflow boxes to allow water to flow from the tank into a sump below. Here follows information about the many ways to add or install a sump, an overflow box, as well as combination setups in saltwater aquarium and reef tank systems. What is a Sump? Do You Need One? 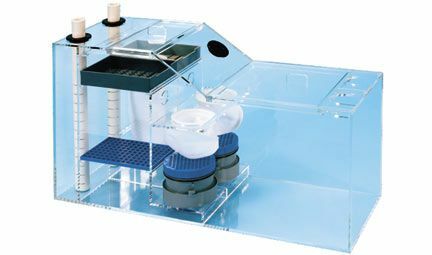 Learn what a sump is, how it is used, the many designs and set ups one has to choose from, and what benefits it can provide your system. Wet/Dry Trickle filters (a.k.a. "sumps") are very popular for housing biological filtration systems as well as protein skimmers, heaters, macro algae and mangrove plants. When combined with an overflow box, even tanks which aren't drilled can take advantage of the many benefits of a sump. When your tank/sump experiences a power failure the first thing that happens is that water is no longer pumped from the sump back into the tank. At this point, unless precautions have been taken, your tank water will siphon down into the sump with the potential of overflowing the sump, right onto that new carpet you just had laid. There is a simple, free solution to having this happen to you. Here's how to prevent aquarium sump overflows during power outages or sump pump failures. Simple step by step instructions for preventing your sump from overflowing. For the do-it-yourself type people, there are a number of plan and instruction sets for DIY Overflow Box Plans which include surface skimming overflows, which are simple and easy to construct. Overflow boxes are normally of the hang-on design and these DIY overflow boxes can be designed for your specific aquarium and water flow requirements for considerably less money than you will spend on a commercial overflow box. Designing and building your own sump has a number of benefits. First of all these sumps are usually much less expensive that commercially available sumps. These DIY sumps can also be designed with your specific aquarium size in mind as well as to house all of the equipment that your saltwater aquarium system requires.